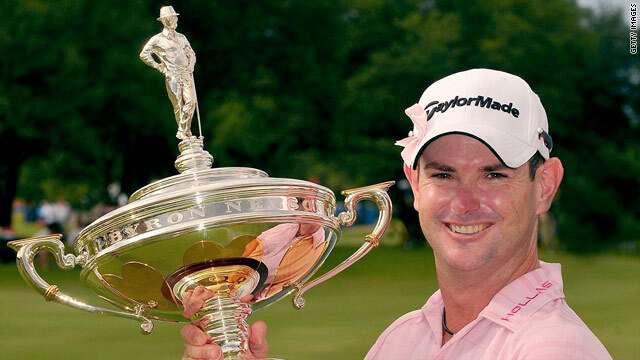 South Africa's Rory Sabbatini won the Byron Nelson Championship in 2009. (CNN) -- Ask most players on Tour and they'll tell you -- the HP Byron Nelson Championship is one of those special events that mean a little more than a lot of the others when you win. Why? Look no further than the tournament's namesake. TPC Four Seasons PGA Director of Golf Paul Earnest explains. PGA.com: The HP Byron Nelson Championship has a distinguished list of winners and rightfully so considering the tournament's namesake. What do you think it means to a player today to win the Byron Nelson Championship? Earnest: Like a lot of champions, winning here is important because this tournament 'matters.' I heard Byron tell many people that it was a goal of his to win all the important tournaments of the day when he was playing. Seems to be almost like a checklist for these great players. We are pleased to have all 27 champions on our wall and look forward to welcoming this year's champion. PGA.com: To me, one of the coolest moments in the history of the tournament came in 2007 when Dallas-native Scott Verplank won it. Verplank had a great relationship with Mr. Nelson and the 2007 edition of the tournament was the first one played since Mr. Nelson's death. How would you describe the significance of Verplank's win that week? PGA.com: The Byron Nelson Championship has had a wide variety of winners, specifically in the type of game they possess. Bombers have won. Shorter hitters have won. Shot-makers have won. In your opinion, which facet of the game is most important to have under control at TPC Four Seasons Resort? Does it come down to a putting contest? Or is there more to it than that? PGA.com: As the PGA Director of Golf, what has been your favorite part of the job? Earnest: For me, the variety of job tasks keeps me motivated. Relationships with the club members, the high-end corporate events that we get to be a part of, a PGA Tour event, and involvement with a five-diamond resort all give me great satisfaction. If I had to boil it all down, it would be just the great people that I get to work with and work for. PGA.com: Can you paint a picture for us about what your week will be like during the tournament? What will you be doing? Earnest: Maître d' would be the best image. Our partners, the Salesmanship Club of Dallas, actually run the event. We are most simply the host site. My job is primarily liaison with media members, club members, industry vendors, PGA Tour, and the Salesmanship Club. We also now have our Cottonwood Valley course open during the event so we have 'business as usual' as well.